Description: Evocative of the Craftsman period. 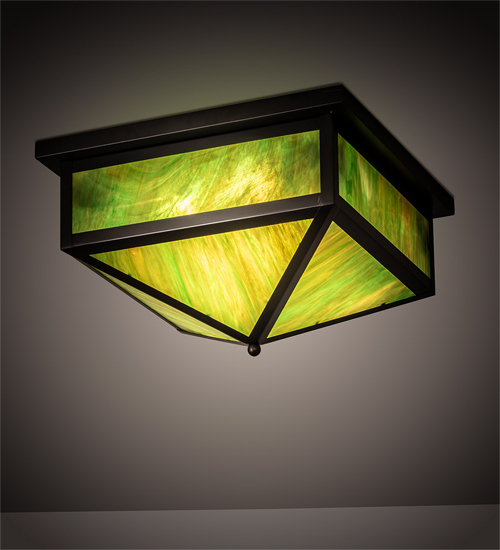 This striking ceiling fixture adds warmth and authentic appeal to interior spaces. This luminaire creates a visually pleasing experience with welcoming ambient light. The stunning Greenish Brown art glass diffuser is complemented with a Craftsman Brown frame and hardware. Handcrafted by highly skilled artisans in our 180,000 square foot manufacturing facility in Yorkville, New York. Available in custom styles, sizes and colors, as well as dimmable energy efficient lamping options. UL and cUL listed for dry and damp locations.